The following is Terry's discussion of "The Graveyard Rabbit" and a column written by Terry for Shades Of The Departed he called "Your Last Chance." I was flattered to be invited to become a regular columnist at Shades of the Departed. When the publisher, footnoteMaven, asked if I would do a regular column on cemeteries, I immediately set out to determine what I could name the column --- or name the work I wish to do with the column --- in order to provide direction for the articles to be researched and presented here. My choice was to call the column "The Graveyard Rabbit" after a poem by Frank L. Stanton. In Stanton's work, he states the graveyard rabbit is "a tiny ghost in the gloom and gleam, Content to live where dead men dream." And because the "content to live where dead men dream" line is so descriptive of the work all of us do in genealogy and family history, I think that Stanton's sentiment will serve well to describe my column here. The moniker of "The Graveyard Rabbit" might not be, however, what the publisher had in mind to call my column --- but watch for my work here as I write about cemeteries, grave markers, photographs of interesting grave markers, and family stories about burials and graveyards. 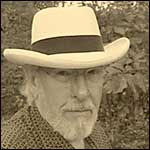 And maybe you will read all of Stanton's poem in the process to learn, indeed, if "the graveyard rabbit hath a charm." I look forward to presenting a monthly column at Shades of the Departed and I hope you will join me on this journey to "where dead men dream." People grow up expressing opinions on just about every issue. Whether asked or not, most of us freely state our desires, our thoughts, our prejudices, our convictions, our suppositions, and our beliefs on all issues universal and personal. While we are living we are full of wanting to express our personality --- we are driven to express that aspect of our being. One issue, however, that many individuals ignore has to do with expressing their wishes about the final disposition of their body in death. This tendency has always been part of the human condition. Some individuals, however, make their burials wishes known so that their personality will actually live on after death. This essay written in 1847 expresses how one individual planned for his burial and then even wrote about the planning. This morning I visited the cemetery, a square-walled enclosure near my bungalow. I walked round it, and fixed upon the spot (if not previously occupied) where I should wish to be buried, in case of my decease at this station, and have given directions accordingly. The spot I have selected is under a tree in a sheltered corner. Little as it can matter what becomes of our lifeless clay, yet I prefer to think that mine will lie out of the glare of the fierce sun in this quiet nook, and I have brought away a twig of the sheltering tree. I often walk into this little burial-ground, to think of the past, the present, and the future. Meditations among tombs are useful, particularly here, where our Protestant church has no minister to perform his office 'between the living and the dead.' Charles Terry, 1847, at Akyab (now Sittwe, Myanmar [Burma] on the Bay of Bengal). In 1910, my Great-grandmother Nancy Lay Thornton selected her burial place and that of her husband, James Monroe Thornton. The story of her selection and her reason for it give hints of her personality that continue to delight her descendants today. Recently I wrote a newspaper column about her reasoning in the selection of the graveyard she wanted. Sometime in 1910, Great-Granny Nancy who was then about 73 years of age, requested her family to take her to visit some of the local cemeteries. They went by wagon or buggy. I like to think that Great-Granny Nancy was enthroned in her favorite rocking chair in the wagon and that she sat behind the driver giving gentle but firm expert advice on the finer points of wagon driving. Certainly if such a characteristic is genetic, many in the family continue to exhibit it. In any event, Nancy directed her family to drive her to New Hope Cemetery and then to Lann Cemetery. A small cemetery, Smith Cemetery, was on the top of a high ridge overlooking Weaver's Creek where she lived --- so she may have asked to go there too. After her visits to New Hope and to Lann were completed, Nancy declared that she and James would be buried at Lann Cemetery because it was "too hot" at New Hope. Nancy selected her burial place for the cool breezes and shade. Today, sadly, all of the large trees that once shaded her burial site at Lann Cemetery have been removed --- but on that hillside in such a pastoral setting the peace and quiet and cool is still most apparent. And just down the hill from where Nancy picked out her cool burial spot is where I wish to be buried --- the spot is already marked. What about you and your family? Have you made any decisions about your burial spot? What factors should be considered? If you haven't, here is a list of some factors and a list of specific issues which may be taken into consideration in your selection of a final resting place. And following these lists are some of the personal reasons which influenced my selection of a burial spot at Lann Cemetery and a discussion of how I had a grave marker installed. Traditional factors. Have generations of your family been buried in a family graveyard? Have generations of your family not been buried in a particular graveyard because of a Hatfield/McCoy type of on-going feud? Sentimental factors. Like Granny Nancy, some of you may be desirous of the cool, shady places. Cemeteries range from the urban to the most rural --- from traditional to modern --- from the commercial to the local. And within that range of burying places are sites for all tastes. Like Granny Nancy, I wanted a rural setting for my burial --- and the cemetery where I will be buried is extremely rural. It is so rural that hunters often sit in the edge of the cemetery during deer hunting season --- it is so rural that often the only sounds to be heard are birds chirping and breezes rustling over leaves and grass. Religious factors. At one time membership in a church almost automatically guaranteed a burial spot in the church's graveyard. But not any more --- most churches no longer provide cemeteries. But certainly in some locations, a church cemetery and/or a church affiliation may factor into where a burial will occur. Some groups continue to exclude non-members from their restrictive cemeteries. Jewish cemeteries are often separate from Christian cemeteries; Muslim cemeteries are often separate as are other religious groups. Racial factors. Even in death, there are many locations in the United States where racial divides are still obvious. Racial factors are also considered in church selection and in funeral home selection. Affiliation factors --- who else is buried there? Cemeteries are often by category. Military, private, public, family, Jewish, Christian, specific denominational churchyard cemeteries, white, black --- and in some very expensive cemeteries, segregation by economic status is also apparent. Other obvious differences in types of cemetery are urban or rural; perpetual care or family maintained. Those of you who also read the many articles published each week by members of The Association of Graveyard Rabbits know that types of cemeteries cover a tremendous range. Pictures posted in these articles show a huge diversity in graveyards. The factors mentioned above are the over-riding issues that all of us automatically consider all of our lives. Most of us grow up knowing what is expected of us by our family and the society we live in. Listed below are some specific issues which most of us put off addressing until we absolutely must. And some of us delay so long that others must make these personal decisions for us. Location or proximity to family. Although it is possible to be buried hundreds or thousands of miles away from where you live and apart from your family, most select a location closer to where the deceased and/or his family resides. Availability of burials sites within a cemetery. Many subscription cemeteries are rapidly becoming "sold out" meaning that all of the available spaces have been bought. If no space is available a second choice must be made. Years ago in a small village where my family and I were living, the local cemetery was expanded and newly available lots were offered. We bought a family plot of four grave sites --- and other family members bought adjoining plots. My wife and I have since changed our minds about wishing to be buried at that location and have transferred ownership of three of our burial sites to other family members. We may use the remaining spot for a memorial bench. Costs. The cost of an in-ground burial spot varies greatly from cemetery to cemetery --- certainly most individuals give consideration to budget. As in other real estate transactions, location - location - location is what controls pricing of burial lots and the prices range from thousands of dollars for a single burial spot to no charge at all. Check with the cemeteries you are interested in for availability of burial spots and costs. Consider also the restrictions for markers and access. Further, consider the arrangements for perpetual care and maintenance of the cemetery and grounds. Many rural cemeteries in the South have perpetual funds to generate income to take care of routine grounds maintenance. Inquire about costs and maintenance. Size of burial spot. Family plots bought and marked off many years ago may not be large enough for today's burials. With the super-sizing of individuals have come "super-sized" coffins and burial vaults. If you require an oversized coffin or want an over-sized vault, you must make sure the burial spot will accommodate you. Someone said it best using the analogy of airline tickets --- you buy one ticket for one seat; that doesn't mean you get to use half the seat next to you simply because you are super-sized. A 36 inch wide burial plot won't accommodate a triple-wide 44 inch coffin --- and some of the older grave sites are narrower than 36 inches. The standard size coffin is 24 to 28 inches wide --- and many of the older lots were for standard sized burials. Personal wishes. Within reason, the burial wishes of the deceased should be considered and in most cases if an individual pre-plans his burial site and makes his wishes known to family, friends, and/or a funeral director, those wishes will be followed. How did I select my burial spot? I, like Great-Granny Nancy, wanted a cool spot. Actually, after my wife and I were almost killed in a horrific automobile accident in 2001, we decided that we needed to plan for the coming eventuality of our death. For more than a decade prior to the accident I'd been of the opinion that I wished to be cremated and my ashes scattered in Wolf River which flowed just a few miles north of where we lived in Tennessee. After the accident, family members decreed that we had to move closer to our sons in Mississippi --- and one thing led to another and we obtained a burial lot in Monroe County, at Lann Cemetery, near where I was born and where my Great-Granny Nancy had selected a spot in 1910 because it was cool. It is the only cemetery we have ever visited that both my wife and I agreed upon --- this is a perfect spot in which to be buried (or, in my case, where my ashes will be interred). We made arrangements with caretaker of the cemetery to select a burial plot. 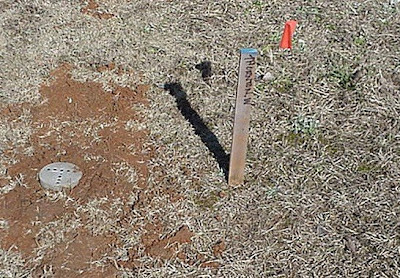 After we selected the site, we marked the corners of the plot with concrete markers set with a "T" for our initial. We then went to a monument company and ordered a grave marker (they called it a "pre-need" order) and made arrangements with them to install the marker. We placed stakes and flags recommended by the monument company at the proper place in the cemetery and asked the caretaker to inspect one last time to make certain the placement of the stone was correct. When he approved, the monument company came and installed the stone --- backwards! --- they installed it completely opposite to the contract and to the drawings they accepted as part of the contract. They sent the crew back to the cemetery in a few days and placed the stone correctly on the second try. The picture below shows the marker with the birth years obscured --- the monument company will return to the cemetery later (much later, I hope) and inscribe the death year. Permit me to close with a suggestion that during this holiday season you will consider your wishes and desires for your own funeral --- and give some thought to expressing those wishes to your spouse, your children, or to your significant other. And some of you may even wish to go far enough to give yourself a "pre-need" tombstone complete with your name upon it! First, however, you have to select a burial spot. . . Happy Holidays! . . .and Happy Planning! Dwight, Theodore W. Commentaries on The Law of Persons and Personal Property. Being An Introduction to the Study of Contracts. Boston: Little, Brown, and Company. 1894, pages 453 - 455. Available on Google Fullview Books; accessed November 23, 2008. Terry, Charles. Scenes and Thoughts in Foreign Lands. London: William Pickering. 1848, page 327. 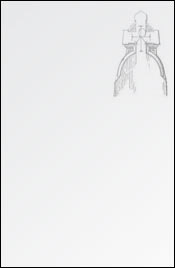 Available on Google Fullview Book; accessed November 23, 2008. 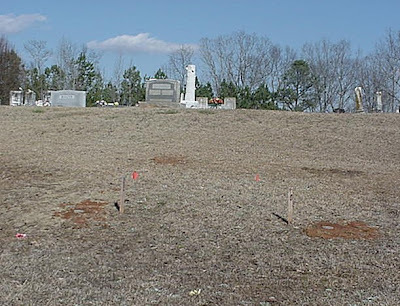 Photographs of Lann Cemetery Burial Site Preparation by Terry Thornton, Fulton, Mississippi, March 2005. Photograph of Thornton Grave Marker, Lann Cemetery, Splunge, Monroe County, Mississippi, by Terry Thornton, May 2005. Previously published The Hattiesburg Hardcopy, Issue 37, June 1, 2005, page 3. Thank you for posting this tribute. I was unaware of where The Graveyard Rabbit came from, even though I have submitted blogs for it. Rest in Peace Terry. I only knew you through your blog, have enjoyed your writing....have learned much from you.